Sterling, VA (February 14, 2003) . 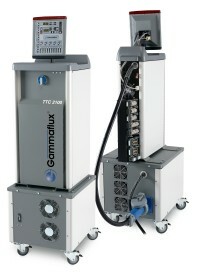 . . Gammaflux L.P. has introduced two new features for its TTC family of hot runner temperature control systems. The new version 2.0 software for the TTC touchscreen interface provides users with a wealth of new features that enhance the systems' usability and data gathering. The new integrated transformer pod for the TTC is capable of housing up to a 45 kva transformer without dramatically increasing the footprint of the controller. data report storage - automatically creates reports upon expiration of programmed report time period, from 1-24 hours; reports are time-stamped and provided in PDF format. Mike Brostedt, Gammaflux Director of Market Development, said that the new version 2.0 software provides users with the most comprehensive and advanced set of hot runner control options in the industry. "This software was designed with the advanced molder in mind, to provide them with the most complete set of tools possible to control and monitor their hot runner molding process," he said. The new version 2.0 software is only for use with the TTC Touchscreen Interface. Gammaflux also offers its recently introduced TTC International Interface, which is a full-featured but lower-cost option for hot runner users that don't necessarily want or need all of the features of the TTC Touchscreen Interface. The TTC International Interface and the TTC Touchscreen Interface are also interchangeable, giving users "plug and play" capabilities should they desire to switch interfaces. With the new version 2.0 software, the TTC can control from 12 - 640 zones. In addition, the TTC is available as a "panel mount" system, which allows the Gammaflux temperature control system to be employed by any injection molding machine as a direct tie-in to the machine's regular control panel, eliminating the need for the separate hot runner control cabinet and interface. Like all Gammaflux hot runner control products, the TTC family features Gammaflux-proprietary PID2 control algorithms, which help deliver smooth, accurate temperature control. Completely modular design allows for quick, easy control card addition and replacement. Designed for worldwide operation, the TTC family features true global input power flexibility so operators can quickly be up and running. Fast startup, multiple language conversion options, universally accepted icons, and security options all contribute to the systems' ease of use.